Construction of the then named Milwaukee and Mississippi Railroad began in 1850. By 1887 it had lines running in Wisconsin, Minnesota, Iowa, South Dakota, and the Upper Peninsula of Michigan. The business was off to a good start and in the 1890s it was time to extend to the Pacific. This extended line began construction in 1906 and finished in 1909. However, the Snoqualmie Tunnel did not yet exist. The original route went over the mountains and was called the Cascade High Line, which ran 9.1 miles. Not until 1912 did construction begin on the tunnel; which eventually opened in 1915 and replaced the Cascade High Line. In 1980 the Milwaukee Road abandoned its western lines and Washington state soon took control of the tunnel and a great deal of the remaining line in the state. This stretch is now part of the rails-to-trails project called Palouse to Cascades State Park Trail, formerly known as the John Wayne Pioneer Trail, and consists of more than 100 miles of recreational trail that reaches from Cedar Falls to the Columbia River. In 2010 the tunnel was closed for 11 months while renovations were underway. Improvements to the tunnel included a layer of concrete to the walls and ceiling, a new walking surface, and a reinforced structure. Today hikers, joggers, bicyclists, and sightseers enjoy exploring the tunnel year round. Motorized vehicles are off limits except for winter months. The tunnel is a 1/4 mile walk from Iron Horse Trailhead at the Hyak parking lot. You'll need your Discover Pass, or you can purchase a day use pass through an automated machine. There's plenty of parking and restrooms here, so use them if needed. The next bathroom won't be found until you reach the other end of the tunnel. Before heading out, take a look at some of the many information boards which talk about this area's history. Once ready, head north passing by a gate, the trail shortly begins to bend west, and here is where the east side tunnel entrance is. It becomes significantly cooler in here. Bring a light jacket and maybe even some gloves. Even during the summer, the temperature is roughly 20 degrees lower inside. Most importantly, bring headlamps and/or flashlights for each person in your group. Make sure you have at least one backup light source as well. 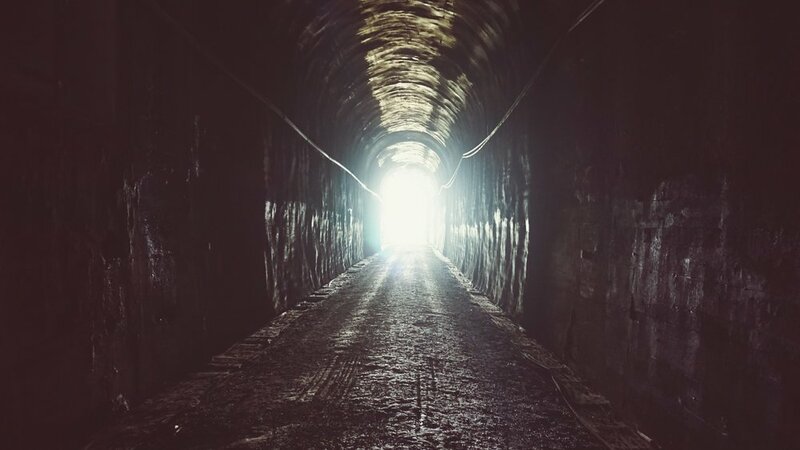 All but the other end of the tunnel is pitch black, and that other end of light is a small little pinhole, it's not going to help you at all. At the entrance we immediately noticed the cold breeze rushing from the tunnel. There were numerous other hikers and bicyclists the day we were there. Sound carries strangely in the tunnel and far off noises echo and have an eerie quality. While others passed by with their lights and their chatter, it was hard to appreciate the dark stillness. In those moments when we were essentially alone, we'd turn off our headlamps just to get a true sense of the place. Once away from the entrance, we were swallowed in darkness. The sounds of dripping and sometimes running water combined with the damp, cold darkness could make this a backdrop for a horror movie. The opportunities to experience our surroundings alone were brief, however, so there was no sense of fright for us. There are numerous alcove type indentions along one side of the tunnel. The remnants of old electrical junctions populate these spaces. There are numbers scribed in spray paint counting off these spaces. We also found plenty of graffiti along the way. As we illuminated the arced walls and roof overhead, we could see the rough overlay of crumbling concrete and multitudes of water stains. The path beneath our feet was hard packed and graveled. Looking straight ahead our breath created misty clouds seen only by our headlamps. In terms of "sight seeing", the tunnel doesn't provide much, it's ridiculously dark inside. The experience of the place is the reason to go and of course the history. It's interesting and unique. We love adventures that allow us to take great photos that we can share with you, but some adventures require us to be more creative and develop images for you with our words. This is such an adventure. At the entrance the name of the tunnel and year are imprinted above the arc. Once outside the exit end of the tunnel and looking back at it there are two arcs, one for the tunnel and the other where equipment of some kind and a telephone used to reside. This end also presents a waterfall to the right as you exit. There is a picnic table here and as mentioned at the start, a bathroom. This was a great time for a brief break and to scout around and check things out. The highway far below can still be heard readily. There are a few decent shots of surrounding mountains. The waterfall, while not large, is picturesque. The trail continues on for some way, but we took our snack break and headed back. More people were here now. The way back was the same as the way in, dark, and seemed longer. It wasn't as cold now, the breeze was at our backs. We enjoyed this excursion. It was a departure from the outdoors treks we usually enjoy, but in a great way. Experiencing history while it still exists is kind of thrilling. This is a monument to man's ability. You only realize how much rock and earth this tunnel lies beneath, once you come out of the exit end and it's hard not to be impressed. This is an easy hike. No elevation changes, no rough terrain. You will need lights, snacks and water/drinks. We recommend a lightweight jacket and maybe even gloves. There were plenty of groups with young children and lots of bicyclists. A great outing for those with a heart for adventure!